Kathryn Schulz’s mind-blowing piece about the big earthquake that’s due to hit the Pacific northwest and our utter lack of preparedness for said event. A gripping read. Terrifying. So terrifying. Jonathan Basile has recreated Borges’s library of Babel on the Internet. In The Paris Review, he writes a fascinating little piece about what he’s learned from all the time he’s spent in that virtual world.
] on the experience of working as a copy editor for that storied institution. As someone who spent a couple of years as a copy editor, I appreciate the way Norris explains the work and the judgement calls that go into implementing a house style. For punctuation and grammar nerds. , an Amazon original comedy series starring the witty and charming duo of Sharon Horgan and Rob Delaney as a couple faced with an unplanned pregnancy. It’s a delightful little confection, and at just six episodes 30-minute episodes long it goes down quickly and easily. It’s one of the most fun, irreverent romantic comedies I’ve seen on a screen of any size in years. I’ve mentioned Marc Maron’s podcast, WTF before, but I’ve gotten far behind on episodes and missed much of it lately. I recently listened to the episode with Daily Show alumnus Wyatt Cenac. It’s a long, great, intimate, revelatory interview that highlights what’s so great about Maron’s podcast, and I highly recommend giving it a listen. The All Songs Considered podcast is where I get much of my new music these days. They recently did a show featuring their favorite debut artists from 2015. I’m particularly looking forward to spending more time with Imam Baildi, Christ Stapleton, and Hunee. Also, their rerun show on the Legacy of the ’90s was loads of fun. Hallucinogenic sunglasses are a thing [ed. link fixed]. 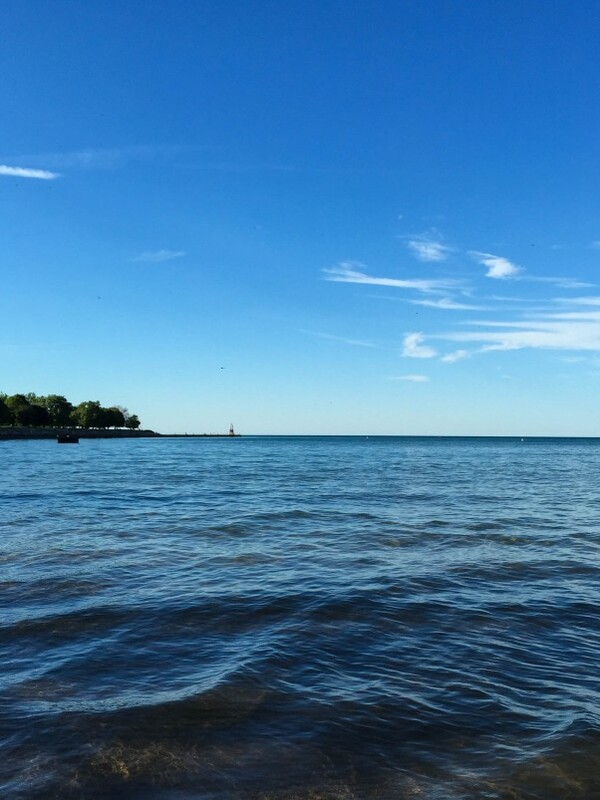 Living close to Lake Michigan in the summer. Just look at that blue sky and blue water.